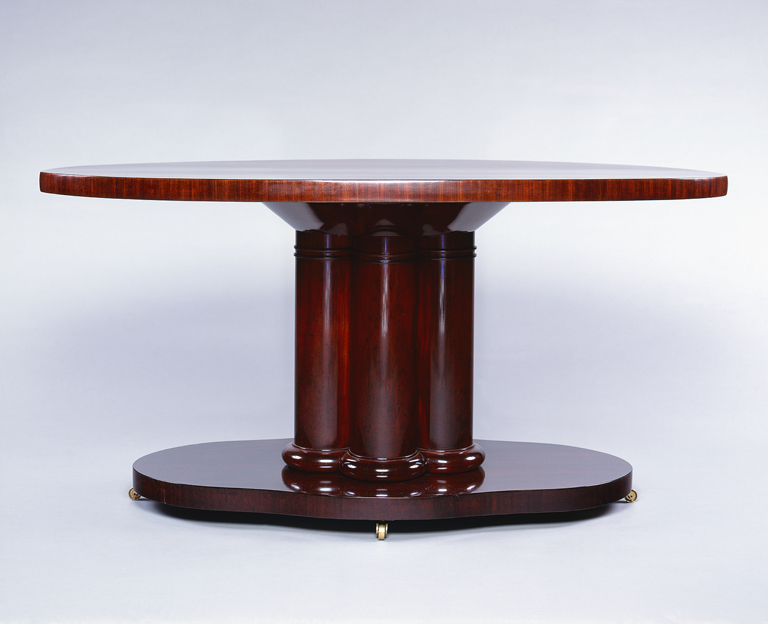 Tables during the Biedermeier period took on a wide variety of functions, ranging from tea, coffee, and dining tables to writing, working, and gaming surfaces. Large round or oval (as opposed to rectangular) tables were typically placed in the main seating area and offered a less hierarchical arrangement for sitters. Hanzl-Wachter, L. Im Sommer auf’s Land-Kaiserliche Interieurs der Biedermeierstadt Baden 67, 2 (2002): 274. Ottillinger, Eva B. and Lieselotte Hanzl. Kaiserliche Interieurs: die Wohnkultur des Wiener Hofes im 19. Jahrhundert und die Wiener Kunstgewerbereform. Vienna: Böhlau, 1997, p. 37. Biedermeier: The Invention of Simplicity, Milwaukee Art Museum, September 16, 2006-January 1, 2007; Albertina, Vienna, Austria, February 2-May 13, 2007; Deutsches Historisches Museum, Berlin, Germany, June 8-July 2, 2007; Musee du Louvre, Paris, France, October 15, 2007-January 15, 2008.